New Illinois State University President Timothy Flanagan. The Illinois State Board of Trustees voted to hire Flanagan, currently president of Framingham State University in Massachusetts, after an extensive national search. Flanagan has served as president of Framingham State since 2006 and also is a professor of sociology. During an introductory press conference May 10 at Bone Student Center, Flanagan said public education is “absolutely vital” to the economic well-being of the state of Illinois. But he said Illinois State stakeholders shouldn’t take it for granted that outsiders know all that the University contributes to the state. The campus community has to tell the ISU story, Flanagan said, especially alumni successes. 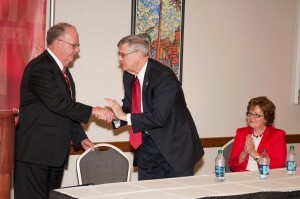 Timothy Flanagan, left, is greeted by Board of Trustees chair Michael McCuskey on Friday. Flanagan’s wife, Nancy, is seated at right. “Ultimately, the reputation of any institution of higher education is developed and sustained upon the accomplishments of its alumni,” Flanagan said. Flanagan will begin his service at Illinois State on August 15, succeeding retiring President Al Bowman. Bowman’s last day will be May 15. Provost Sheri Noren Everts will serve as interim president from May 16 to August 14. Flanagan’s appointment May 10 kicked off a busy weekend on campus. The Board of Trustees held their regular meeting later that morning. And Illinois State’s six spring Commencement ceremonies were set to begin that afternoon with the Mennonite College of Nursing and carry into May 11. Flanagan was chosen after a search that lasted four and a half months, sparked by Bowman’s announcement in December that he would retire. Michael McCuskey, who chairs the Board of Trustees and the presidential search committee, cited Flanagan’s successful history in leading universities, including serving as provost and vice president for academic affairs and a professor of criminal justice at College at Brockport, State University of New York. Academic Senate chair Dan Holland and Student Trustee Aaron Von Qualen also praised Flanagan’s appointment. Their remarks were shared in a written statement. Flanagan was introduced May 10 alongside his wife, Nancy, who holds a Ph.D. in nursing and has a background in nursing education. The Flanagans say they’re eager to get to know the Illinois State campus and Bloomington-Normal communities. At Framingham State (with an enrollment of around 7,000), Flanagan said he blocks off time in his schedule every week to connect with students in person. “It’s incredibly energizing” being around college students, Flanagan said.